The Obama administration refuses to enforce Federal laws which Obama finds ideologically or politically objectionable, while claiming that He is obligated to enforce them. “We’ve got a government designed by the Founders so that there’d be checks and balances. You don’t want a president who’s too powerful or a Congress that’s too powerful or a court that’s too powerful. Everybody’s got their own role. Congress’s job is to pass legislation. The president can veto it or he can sign it. … I believe in the Constitution and I will obey the Constitution of the United States. We’re not going to use signing statements as a way of doing an end-run around Congress.” (5/19/08). Please also read and consider the remaining twenty. Was Obama Grubering — lying and obfuscating — when He said those things, is He Grubering now, or both? There has already been ample speculation about the Royal Decree which Obama intends to sign and blather about this evening. Speculation is interesting. However, we should be in a better position after His address to compare what He says with what He is likely to do and to consider the potential consequences for us, for the Congress and for Him. It’s also reasonable to assume that the “legitimate” media will find little if any fault with Obama’s Royal Decree or its implementation. Leftists generally seem to feel that He can do no wrong when He agrees with them, as He customarily does. Chris Lehane is the proud author of the 1959 “vast right wing conspiracy” memo relied upon by St. Hillary of Clinton back when her husband was wrongly rightly accused of multiple derelictions including sexual misconduct in the While House and lying about it, publicly and later under oath. After reading and interpreting copies of Obama’s address and His Royal Decree, I will try to analyze His Gruberings. Perhaps this time the “legitimate” media will do its job and illuminate at least some of Obama’s malfeasance. Don’t count on it. 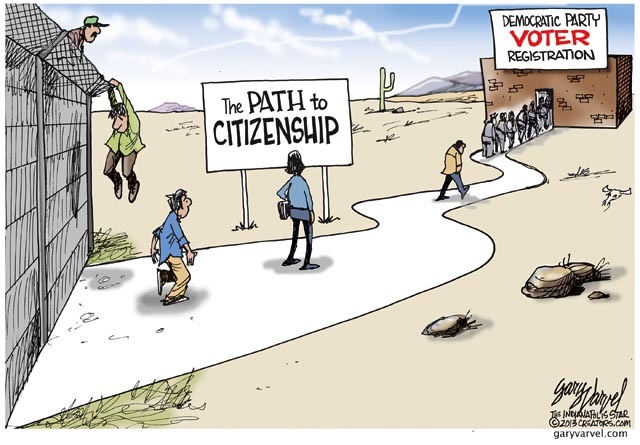 Yet behind the scenes, the president was busy directing his team of lawyers to find real or perceived loopholes in the law — even the Constitution — in order to wave his royal scepter and instantaneously turn as many as 12 million illegal aliens into America citizens. Already he had quietly ordered the federal government to stop deporting aliens and unilaterally allowed some 60,000 “unaccompanied minors” to enter the U.S. The bull will probably notice and respond. But how? This entry was posted in Abuse of Power, Congress, Conspiracy theories, Constitution, Democrats, Domestic policies, Duty, Executive Order, Jonathan Gruber, Leftists, Legislation, Limitation on Authority, Media, MSNBC, Obama, Obama Dream Order, Obama Nation, Politics, Power, Republicans and tagged Abuse of power, Congress, conspiracy theories, Constitution, Democrats, Executive Order, Jonathan Gruber, Legislation, media, obama, politics, Power, Republicans. Bookmark the permalink. To gruber, or not to gruber, that is the question—whether ’tis nobler in the mind to suffer the slings and arrows of outrageous Republicans, or to take arms against a sea of stupid voters, and by grubering, end them? Ah yes, Hamlet. The answer is “to gruber,” fast and furious(ly).